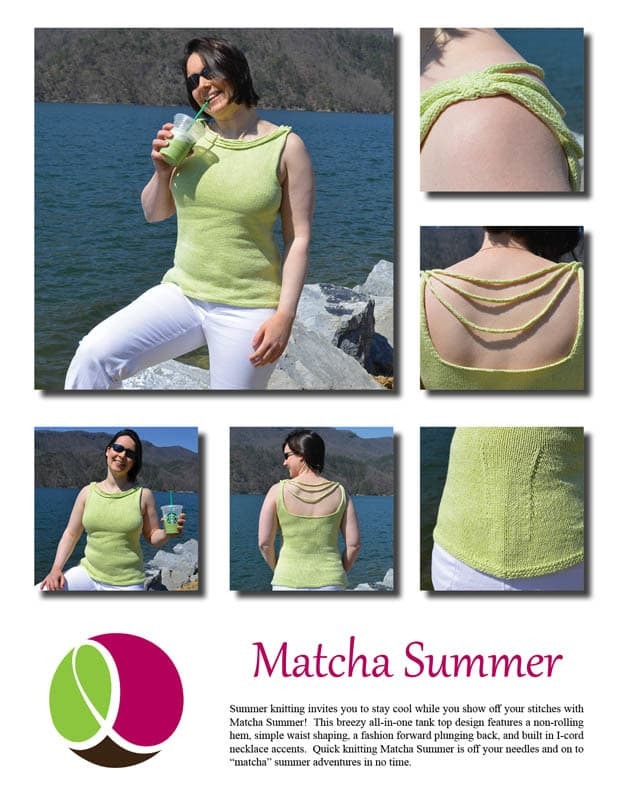 Summer knitting invites you to stay cool while you show off your stitches with Matcha Summer! This breezy all-in-one tank top design features a non-rolling hem, simple waist shaping, a fashion forward plunging back, and built in I-cord necklace accents. 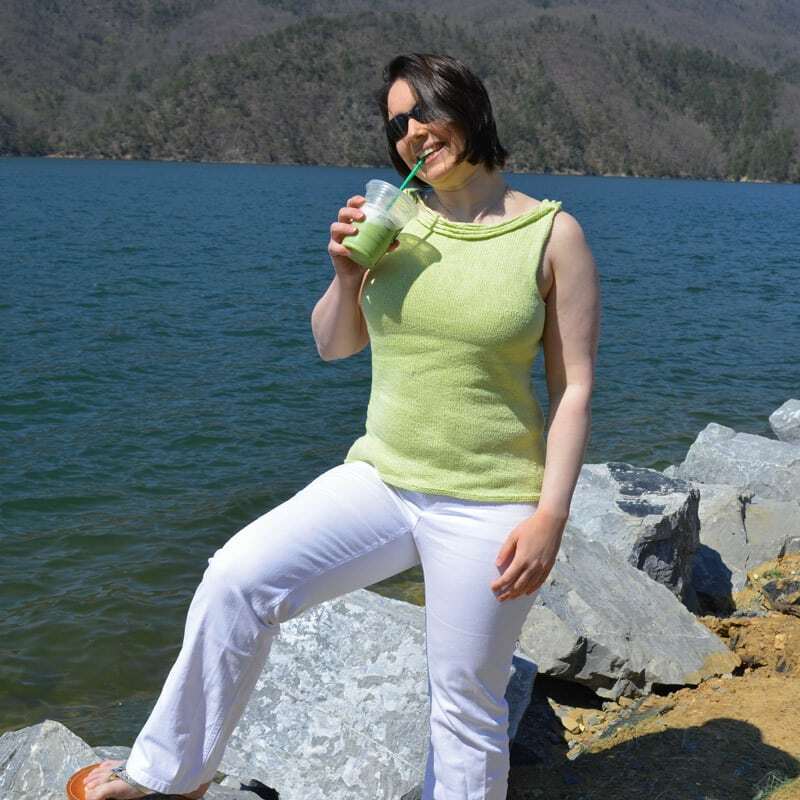 Quick knitting Matcha Summer is off your needles and on to “matcha” summer adventures in no time. The tech edited and test knit pattern includes written directions and a schematic. There are 2 photo tutorials related to the pattern on Knit Eco Chic’s May 2017 blog. For Bust Sizes 32”/ 81.5cm (34”/ 86.5cm, 36”/ 91.5cm, 38”/ 96.5cm, 40”/ 101.5cm, 42”/ 106.5cm, 44”/ 112cm, 46”/ 117cm). Blocked Bust: 31.25”/ 79.5cm (32.75”/ 83cm, 35”/ 88.5cm, 37”/ 94cm, 39.25”/ 100cm, 40.75”/ 103.5cm, 43”/ 109cm, 45”/ 114.5cm). Total length: 21.25”/ 54cm (21.5”/ 54.5cm, 22”/ 56cm, 22.25”/ 57cm, 22.25”/ 57cm, 22.5”/ 57.5cm, 22.75”/ 58cm, 22.75”/ 58cm). 2 (2, 2, 2, 3, 3, 3, 3) skeins The Unique Sheep Organic Cotton Petite DK. Shown in color Matcha Latte. Single skein info: 100% organic cotton grown, processed, & dyed in the USA. 265yds/ 242m per 100g/ 3.5oz. 22 sts and 34 rnds over 4”/ 10cm using US 5/ 3.75mm circular needles. If substituting yarn, make sure your blocked stitch gauge matches and follow the “If substituting yarn” sections throughout the pattern. *About the fit: there is zero ease around the hips, a slight negative around the waist and bust, and zero ease across the upper chest to provide a form fitting summer tank that is comfortable to wear. If customizing ease, please reference the schematic for more details. *Minimal finishing is key to this design! Knit in the round seamlessly from the bottom up, the shoulders are joined with the three needle bind off method. To save finishing stitches, an I-cord bind off method is used for the underarms and neck. 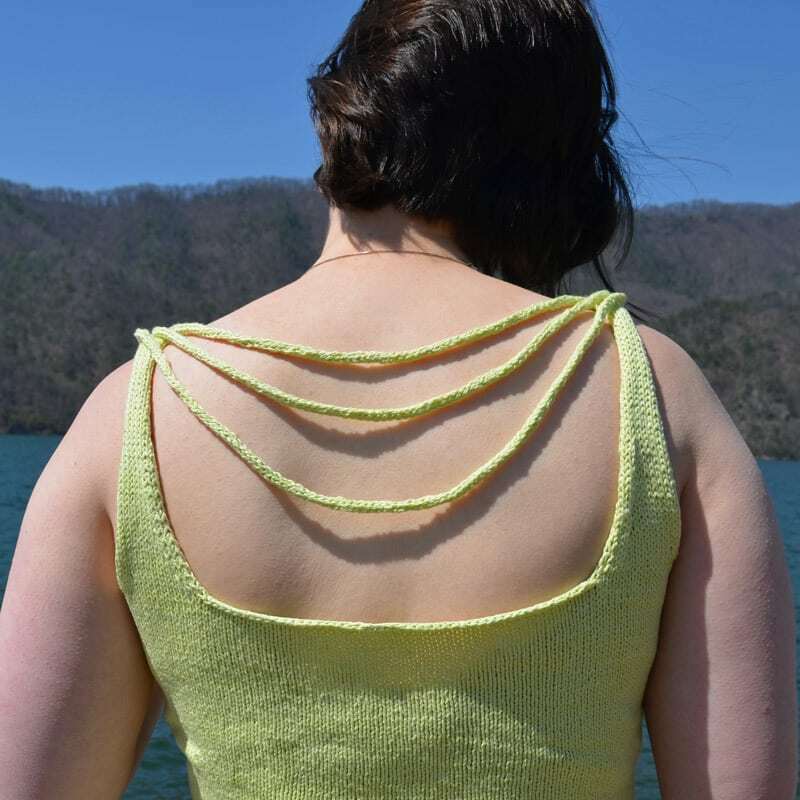 *Check out the Knit Eco Chic May 2017 “Summer Knitting Tank Top Tip” blogs for two photo tutorials. The first (May 4th) shows the underarm I-cord bind off step by step. The second (May 11th) shows a neat shoulder 3 needle bind off trick.